Okay, the Fatboy has been out for sometime and is now being produced in a 10 inch version thereby appealing to a greater audience. For those who have purchased and/or upgraded, could you please give us your impressions? Please include your current table, cartridge and former tonearm. Johnny, I've posted an extensive review/comparison between my fatboy and the arm it replaced, an original 12" 3D. Search under my name and it should pop up - I posted it about a month ago. The headline: it is an outstanding arm, well worth every penny. Thanks teenage diplomat, I did read your well thought out review and I appreciate your insight. 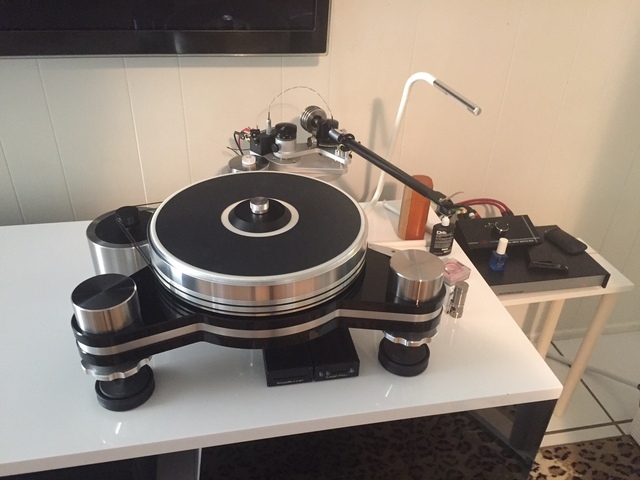 Bob's Devices will be playing a Fatboy Gimballed arm on a VPI Prime Signature Rosewood at the California Audio Show in Oakland, CA this weekend. If you are in the San Francisco area, come by and bring your favorite record, or buy one at the show. Demo cartridge will be the Ortofon Cadenza Bronze. It really does come down to whether you like it or not. We all hear things differently. I think these arms are now at the level where differences are probably subtle. The trade in program makes A to B comparisons less likely. Once you get to the level where the deck does nearly everything well (a knowledgeable party who won’t be named was once quoted as saying that over $6k is often just turntable bling), it becomes harder to sort out what’s better and what’s just different. HW is using master tapes and level matching for comparisons, and that’s really the only valid method. Few can do this. I can’t, for example. I level match, but I do not have master tapes and matching vinyl disks. I have two VPI built 10” 3D printed arms right now. The one is a JMW unipivot mounted on a Classic 3 with the fancy feet and an SDS. The other is the gimbal style that VPI designed and built for the Levinson 515. The Levinson was designed and built in its entirety by VPI and it’s motor and controller appear to be very similar to the ADS. When both are set up well, they both sound great. But for me, the unipivot set up experience is still aggravating and unpleasant compared to a gimbal. Even with the dual pivot, it’s not without fiddling and aggravation. Now I’m sure that someone who cut their teeth on unipivots could do it faster than I can. But that’s not important to me. In my system, Gimbal style setup = 15 minutes tops, maybe less than 10 in many cases. On the other hand, in my system, Unipivot style setup = 45 minutes minimum, and probably more. So this setup time is important to me when I’m auditioning different cartridges. Otherwise, it’s not. In the end, I agree with HW’s thoughts the other day when he was asked about unipivot vs gimbal. To my ears, the gimbal style gives tighter, better bass, and the unipivot gives a sweeter treble. But I would judge neither as lacking. People pick one over the other based on personal taste and preference. Last night I did some more comparisons between the Levinson 515 and the Linn LP12 w/Radikal, Keel, and Ekos SE. The Levinson is sporting the stock Ortofon Cadenza Orange. The Linn has a Lyra Delos. Once level matched, the one I like the best is the one I’m listening to. Which one matches the tape? I dunno... I don’t have the tape. Which one sounds more like live music? They’re both convincing. FWIW, you may get a free improvement by moving your speakers around. Until you’ve really optimized speaker placement, a lot of the rest, including resolution, warmth, soundstage, pitch, and timbre, are literally impossible to truly assess. A lot of people throw money at their system without dealing effectively with the room and speaker placement. This is nearly always expensive and disappointing. Peer Gynt wrote: It really does come down to whether you like it or not. We all hear things differently. I had a chance to see a static displayed ML 515, much more impressive in person. Definitely a VPI family resemblance. Any othe Fatboy owners who upgraded? True, although a careful reader would mark your summary as incomplete. The only way I will ever hear it in my own system will be to buy it. I am waiting for VPI to open their listening house ... I may plan a trip north just for the fun of that.